Childhood Obesity describes a condition where children carry too much body fat for their height. This is from a combination of getting more calories in from food and drink than they need (eating too much or the wrong kinds of foods) and not burning enough calories off through physical activity and an active lifestyle. Why is it important for my child to be a healthy weight? Studies have shown that children who are a healthy weight for their height tend to be fitter, healthier, are better able to learn and have more self-confidence. They’re also much less likely to have health problems later in life such as diabetes and heart disease. 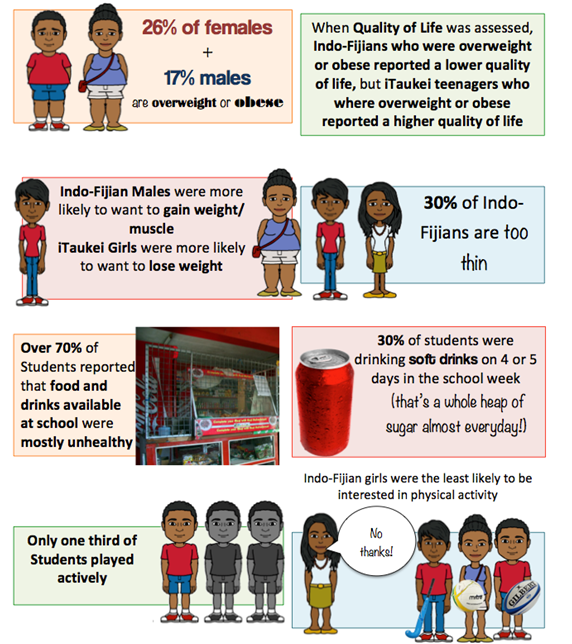 How common is childhood obesity in Fiji? 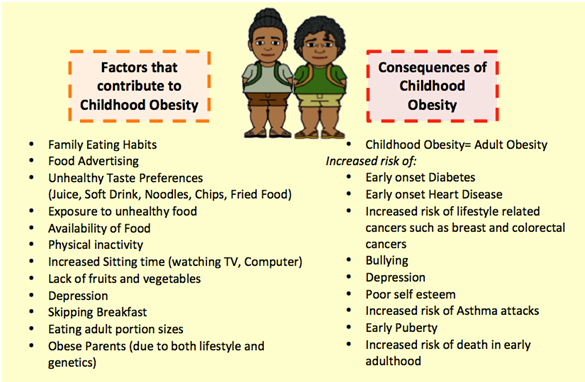 The latest results from 2004 show that like adult obesity, childhood obesity is on the rise in Fiji. 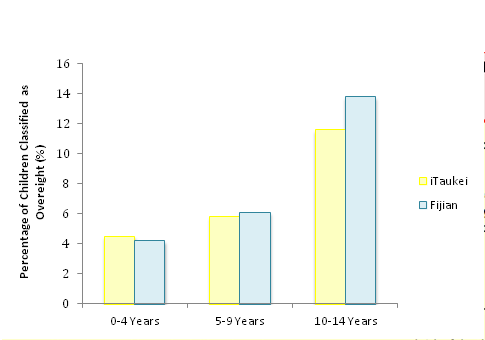 The graph below shows that there is a similar amount of iTaukei and Fijian children classified as overweight (based on weight for height) and the prevalence increases with age with 12-14% of 10-14 year olds classified as overweight. How can I help my child keep a healthy weight? First things first –NO DIETS! No child needs to go on a diet, and only very rarely would any child need to lose weight. Children gain height at a rapid rate so we encourage children to grown into their weight instead. This means they grow taller rather than smaller. We also want to encourage children into fun lifestyle changes rather than restrictive diets and forced activities. 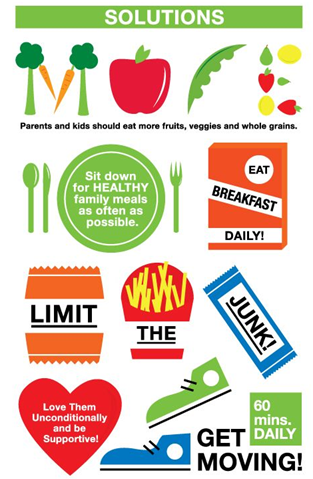 Here are 6 simple steps that can help your child achieve and maintain a healthy weight. children learn by example, meaning the most powerful way to get them into a healthy lifestyle is to jump into one yourself. Set a good example by being physically active and choosing healthy foods. Better yet, organise some family activity time such as a walk, game of Frisbee/touch/volleyball and enjoy healthy meals together. children need 60 minutes of physical activity a day for good health. This doenst have to be done all at one- it could be a 15 minute walk to and from school, a 20 minute play after school and a 10 minute game at lunch. For younger kids it can involve active play such as ‘tag’, climbing and playgrounds while for older children getting them into a sports team is a great way to encourage them into staying active for life. children are a lot smaller than us adults. This means they require less food, through smaller portions. It’s hard to know exactly how much food your child needs but the good news is they are better than us at self-regulating their food. This means they’re more likely to eat only what they need. Avoid using rules such as ‘finish your plate’ and avoid serving large portion sizes as this takes away their ability to regulate their food. 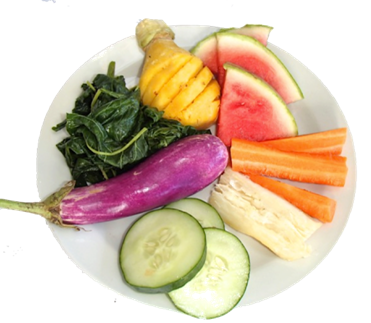 Choose healthy local foods: aim for 5 a day! That’s two serving of fruit and 3 servings of vegetables. This will fill your child up with healthy vitamins, nutrients and plenty of fibre and prevent them choosing unhealthy snacks. Limit screen time: kids these days and spending up to 20 hours a day sitting. They sit on the bus, in the car, in class then sit to watch TV and use the computer. Encourage them to explore the great outdoors for at least an hour a day to cut down that sitting time. You can also get them up and about after dark by having them help with the cooking! Feed them like a king at breakfast: breakfast is the most important meal of the day. It keeps them fuelled for learning and gives the day a healthy kick-start. Studies have found children who skip breakfast are more likely to miss out on important nutrients their body needs to function well, they are more likely to be overweight because breakfast plays an important role in appetite control and they are more likely to find concentration in class difficult, feel tired and lack energy. A healthy breakfast is crucial for brainpower and performance throughout the morning, it is fuel for the body and without it, your child will struggle (and the same goes for adults).